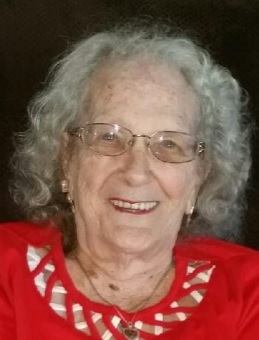 Edna Mae Taylor, age 87, passed away May 1, 2018, at home surrounded by family in Mesa, Arizona. She was blessed to have lived a long happy life. She was born November 1, 1930 in Kansas City, Missouri to Walter and Mae (Dillard) Albert. She had 5 siblings of which her three sisters preceded her in death; Louise Frazer, Bunnie Culbertson and Bobby Nixon. She leaves behind two brothers, Bud Anderson (Maxine) and Bill Landsman (Nancy). She married her love of her life James Elmer Taylor on December 22, 1948 and was married 51 years when her loving husband passed away on January 30, 2000. They lived in Ruskin Height Community in Kansas City, Missouri. During her younger years she enjoyed bowling. Edna was on a couple’s bowling league where she received several trophies. She was a stay at home mom most of her years and would work when needed to assist her husband. She gave birth to four children of which two of them preceded her in death; Jerry Wayne Taylor in 1969 (19 years old) and Ezra Paul Taylor in 1961 (newborn). She leaves behind her oldest son James Elmer Taylor Jr.; her daughter Sandra Herrera (Frank); 7 grandchildren; Sondra Yarbrough (Olaleye), Stacy Rodriguez, Jesse Rodriguez, Frankie Herrera, Steven Herrera (Patricia), Nikkie Taylor and Robin Taylor. She has 13 great grandchildren; Andrew Yarbrough, Antonio Yarbrough, Krystallynn Yarbrough, Frankie Herrera Jr., Alexis Herrera, Breanna Herrera, Adrian Herrera, Marissa Herrera, Tony Luna JR, Orlando Callejah, Charlie Herrera, Denise Herrera, Marcos Rodriguez. She has 9 great-great grandchildren; Jaxen Rodriguez, Ziyah Taylor, Vaiydn Taylor, Allen Bass-Goodman, Devin Diaz, Sophia Luna, Emily Luna, Jazleena Luna, and Angel Luna. Edna has lots of nieces and nephews. She was a wonderful mother and grandmother who would do anything for anyone who needed help. She was loved very much and will be in our memories forever. Her faith in the Lord helped her get through her final days. She rests in peace in the house of the Lord with her family members who preceded her in death rejoicing together once again. Funeral services will be 2 p.m., Wednesday, May 10, 2018, at Park Lawn Funeral Home, 8251 Hillcrest Rd., followed by graveside services at Green Lawn Cemetery, Kansas City, MO. Visitation will be from 1-2 immediately before funeral services. Edna leaves so many childhood memories I will forever cherish. I absolutely loved going to her home as a young person. I was treated like I was meant to be there, my second home would be an understatement. Many trips to the mall, movies or the store. Always encouraging words as she would take us kids where we wanted to go. Always making sure we had money and had coats if it was cold. I was always invited to stay for dinner without a second thought, Edna would always say you know your always welcome. It was a great joy to have her get to see my home and meet my husband several years ago. A precious, selfless, Christian woman I have had the pleasure to have known since I was eleven years old. My love and memories will never fade for Edna was like my second Mom growing up. I will always love her and know I was dearly blessed to have had her in my life. My thoughts and prayers to the whole family whom I love.